Cassini is eBay’s internal search engine. 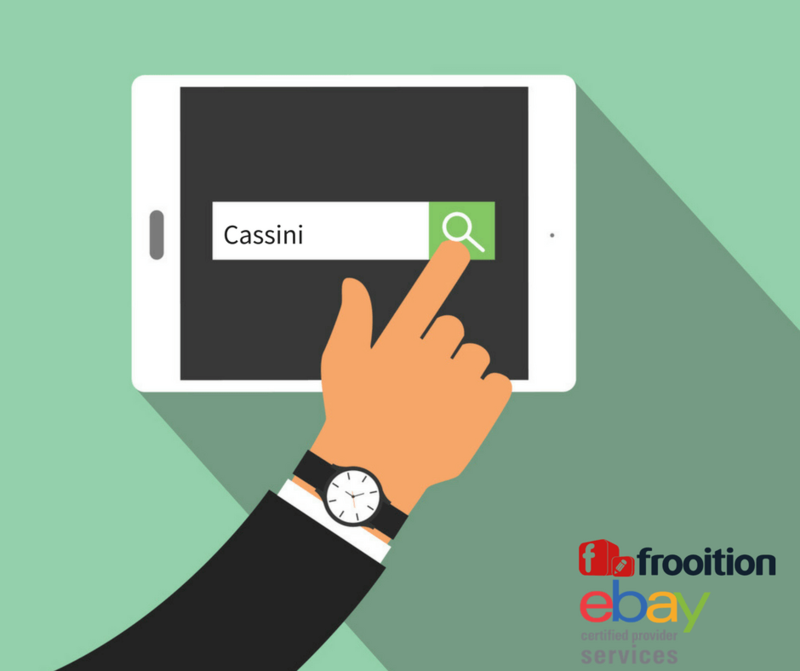 Every time a customer searches on eBay, Cassini learns about how people search, engage, and purchase on eBay. To clarify, when a person searches on eBay, Cassini doesn’t just look at the search term and matching listings, it looks at the history of the individual searching too. Cassini looks for patterns in the customer’s past buying behaviour to establish what is most likely to inspire them to buy. As a result, it’s able to score listings based on how well they meet individuals buying preferences. We are not able to influence individuals past buying preferences, but so many people shop on eBay, there will always be one who likes what you have to offer. Therefore, it’s important to make sure that all of the above points are complete and correct so that Cassini can match your listings to customers who will want to buy from them. When a customer comes to eBay and types a keyword into the search box, they’re shown every listing with that keyword in the title. This could be hundreds of thousands of listings. No customer wants to trawl through all that. So, Cassini sorts them to show the most relevant results first. Each of these metrics has a whole host of best practices which should be followed to ensure that your product ranks well. There’s no one answer for how to rank well with Cassini. But, by understanding how Cassini works you can tailor listings to better meet requirements for a top result. The most important thing to keep in mind is that eBay wants customers to see results that are relevant to them. Above all, eBay wants customers to see listings they will want to buy from. There’s no point in showing laptops to someone who’s only looking for a case. On the other hand, eBay knows that most customers want lots of results from a primary broad search, which they can then narrow down. Some will filter by adding keywords to their search, likewise, others will use the filters in the left-hand column. Either way, results will be determined by title and item specifics. Firstly, it’s important to have full and correct category and item-specific information. These drive the filter engine in search results. Often, you may filter and see a list of brands, colours or sizes on the left-hand side, and then at the bottom will be ‘unspecified’. If you don’t fill in item specifics, your item will be in with the ‘unspecified’ and go unseen. A good item title uses core product key words that describe the item. You can use up to 80 characters your product title. Many people advise to try and fill these 80 characters with as many key words as possible. But, that’s not always a good idea because Cassini bases your ranking on more than just your listing title. Cassini ranks your listings on engagement. That is to say, when a customer searches a key word which brings up your listing, Cassini counts this as an impression. Even if you’re result twenty-two on a page where the customer only looks at the first two results. Being on the page is enough to be counted as an impression. If the customer then adds another key word or uses category filters, and your listing is a result again, that’s a second impression. Cassini compares the number of impressions your listing has to the level of engagement. The resulting percentage determines how relevant your listing is. This relevance determines how it ranks. Padding your item description with broader search terms increases exposure, but dilutes customer engagement. This damages ranking. One of the best ways to find specific keywords and phrases that customers use to search for an item is to use the eBay keyword research tool –Terapeak. Titles should be written for buyers. Writing in a smooth, readable way will get you a better engagement rate. A pile of keywords thrown together won’t attract customers. Qualifiers such as designer, material or colour are helpful to a customer and Cassini. But,using other brand names with phrases such as “just like” breaches eBay rules and will result in listings being taken down. Even if eBay don’t remove them, this weakens customer engagement, so damages ranking. Special characters are still sometimes seen in eBay titles. This outdated technique for catching customer attention. It only irritates modern customers and is seen by Cassini as a bad practice. So, it won’t help ranking. By creating listings that are more attractive to customers, you will increase the time customers spend looking at your listings, as well as how many choose to watch or bid. This in itself can only be a positive thing, but it will also increase the ranking of your listings. Listing format can also influence engagement. A single quantity fixed price listing presents one item to appeal to the millions of eBay customers. On the other hand, multi variation listings, incorporating multiple sizes and colours into one listing, have a much wider potential group of people to appeal to. Creating multi variation listings instantly increases buyer engagement. Driving traffic from social media is one way to increase engagement. Froo apps smart social is a free app which automatically promotes listings on Facebook and Twitter. Cassini is a sophisticated search engine. It’s designed to reward good sellers. Sellers who strive to answer the needs of their customers with honesty, creating transactions that are good for everyone involved. With this in mind, honest, clear and informative listings, categorised correctly and supported with excellent customer service, will always rank well.